In this blog in part one I talk about emotions, the energy and vibrations of emotions. I will also be talking about how emotions impact us and potentially even future generations. In part two I talk about how we can discover these emotions and about how we can change or release them to help us reach our highest level of performance. Being aware of emotions in our lives is important to understanding our energy, our life force, our spiritual and our emotional well-being. We are energetic beings and each of our cells and organs are constantly vibrating with energy. This energy comes to us in various ways: through our environment, through our foods and through our thoughts and emotions. 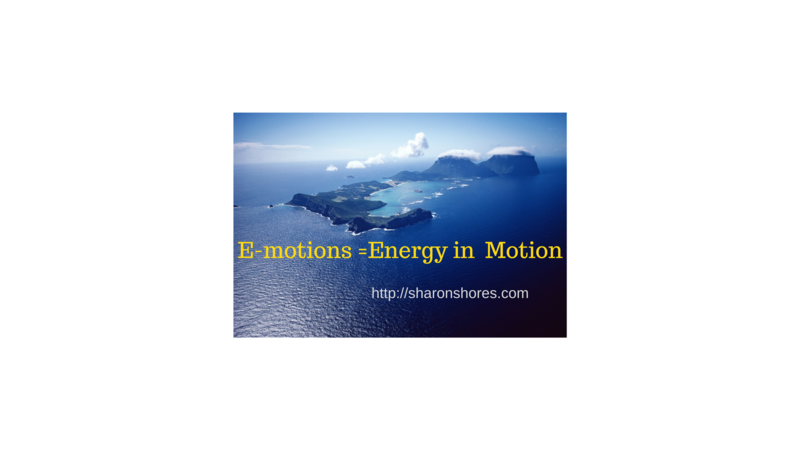 Emotions are “energy in motion”. Do you know the root meaning of the words emotion and motion are the same! Exmovere or emovere (emotion) means to move out? And the meaning of Movere, (motion) from the Latin, means to move? Emotions=Energy in Motion. It has also been discovered that 30 seconds of heart felt intention will alter not only your own destiny but also impacts the lives of others in this generation and potentially the next 3 generations! (Dawson Church, The Genie in your Genes-2009). It’s also been discovered that positive thoughts increase telomere length. Thought to ponder: So if heart felt intention can be transmitted to others as well as over the next 3 generations-is it possible that also not so good intentions/negative intentions can be transmitted to future generations? Dr. Hawkin’s chart shows the vibrational level of emotions. Note the emotion of fear vibrates at a very low level while joy vibrates much higher. Thoughts to ponder: What kind of energy from emotions (energy in motion) are you adding to your life? In general, during the day at what vibration level are your emotions? So what does this have to do with what you are experiencing in this moment? Our thoughts create emotions and the emotions become “energy in motion”. One of the properties of “energy” is that “like attracts like’. So let’s take an imaginary trip-let’s imagine we can explore your inner being—and as we do this we come across a memory perhaps where you were bullied or someone said something to your that was not so kind. That memory of the emotions you may have experienced now resides in your DNA potentially shortening your telomeres leading to cellular aging and with cellular aging comes the potential for disease. Now imagine your grandfather, great grandmother or other previous generations and imagine the emotions they may have experienced that got locked into their cells? Given the fact that research has demonstrated heart felt intention can be passed on for 3 generations here are some thoughts to ponder: What emotions-energy in motion were potentially passed on to me that I am not even consciously aware? Kind of makes your brain to tilt, doesn’t it? What if there are emotions in your body that you are not even aware of that are causing-lack, depression, frustration, anxiety –what do you do? How do you find out if it is there and even more important how do you get rid of it and or transform it? Now for just a moment –come back into this moment and take a look at what you are currently thinking –what thoughts are going into your mind? As you listen to the news, view posts on Facebook, post on Facebook, drive along in traffic, listen to music –what emotions are you experiencing and taking on? Do these emotions include disgust, anger, despair, fear, and judgment? Remember the lower vibration energy emotions shorten your telomeres. Or are the emotions joy, peace, hope and love? Are you experiencing good emotions that lengthen the telomeres in your DNA? In part one I have explored how emotions are energy in motion and how these not only impact our DNA but our health and well-being. In Part Two I talk about how we can discover these emotions and about how we can change or release them to help us reach our highest level of performance. People Are Asking for Wisdom & Guidance-Perhaps YOUR wisdom & guidance! Maintaining Sanity in a Chaotic World-Ten Ways to Stay in Balance!